In February 2017, I was fortunate to be invited along with four other Bermudian professionals to take part in a 10-day International Visitor Leadership Program. This program was facilitated by the United States’ Department of State in conjunction with the U.S. Consulate in Bermuda. The focus of the International Visitor Leadership Program was “Workforce Development”; a timely topic as this is a current area of concern in Bermuda. The group travelled to four U.S. States, visiting seven U.S. cites and meeting with over twenty diverse organizations that were engaged in workforce development initiatives. The Bermuda delegation gained a sound understanding of the aims and objectives of those organizations, the strategies that led to their organizational effectiveness and the barriers that prohibited those organizations from meeting their output objectives. During the course of the program, it was evident that workforce development is a national priority. This was particularly highlighted by the Workforce Innovation and Opportunity Act, signed into law by the former President Barack Obama in 2014, which provides the legislative framework at the federal level, and drives and supports most of the workforce development systems at both the state and regional level. The Act is designed to help job seekers access employment, education, training, and support services to succeed in the labour market as well as to match employers with the skilled workers they need to compete in the global economy. 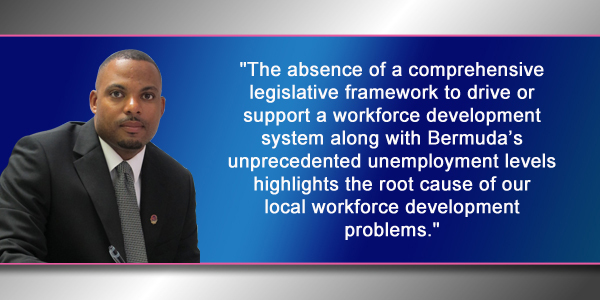 The absence of a comprehensive legislative framework to drive or support a workforce development system along with Bermuda’s unprecedented unemployment levels highlights the root cause of our local workforce development problems. Organizations operate in an aligned workforce development system sharing common goals and objectives while leveraging resources to ensure the system meets the needs of the business community and the people that they serve. The U.S. workforce development system provides the necessary advanced education and training, equipping people with the skills and knowledge needed to participate in the economy and compete in today’s workforce. There was a relatively high level of engagement with the business community by organizations in the workforce development system, creating an understanding of employers’ needs and facilitating mutually beneficial partnerships. The reduction in the number of employed Bermudians falling from 26,187 in 2011 to 23,576 in 2015. A workforce development plan for Bermuda is fundamentally critical as it will create the framework for an integrated system of effectiveness and provide Bermuda with positive social and economic outcomes. Provide a frame for workforce development incentives for employers. We must recognize that there is an urgent need to address the pressure that unemployment has placed on our current system. The current skill and interest gaps that has created a mismatch between what businesses require and what is possessed by the unemployed will not realign themselves without critical intervention. There are currently more jobs in the market than Bermudians in the workforce which points to untapped opportunities for Bermudians. No longer should a lack of work experience, education, technical and soft skills be used as an excuse to not hire Bermudians. We need a strategy to match job seekers with jobs; and a well-structured workforce development plan can get Bermudians back to work. Why don’t u read the column and try and understand rather than posting silly comments? Anytime a Black man does something positive for his people, de yahoo’s chime in. Jason, Term Limits and Paula Cox’s massive and unexpected payroll tax increase during the financial crisis is what killed employment opportunities for Bermudians, both young and old. Now we are heading in the right direction after years of going full speed in the wrong direction! Since the PLP dug us a huge debt hole, our taxes have increased which is only going to drive the cost of labor up which is going to inevitably hamper job growth. That’s the facts, interpret it as you like. If the CS was the correct size the available jobs to population ratio would change significantly. Quid pro quo Mr. Hayward? All of these points are very vague, and they skip over one hugely important thing: that Bermudians fall way behind other developed countries in math and language skills from public school age. Bermuda is a knowledge-based economy. Almost its whole economy is based on insurance and financial services. If the local workforce don’t learn basic math or how to write a business letter in high school, then they can’t provide the skilled labour that is needed. No amount of “workforce development programs” or “pipelines and career pathway opportunities” or any of those other buzzwords will change that. why doesn’t the union offer development programs for its members? That would be too much to ask of them I know of a program they helping to run but can’t even secure jobs for the persons cause they dumb down the requirements for qualifications and they have their educators who are out of touch. This statement right here is an attack on employers, while shows the complete lack of understanding that all of the mentioned are REQUIREMENTS in a modern employment context. Hiring Bermudians in any industry sector is easier, more cost effective and better for any business in Bermuda. So they are not making excuses not to hire Bermudians , they never have. It is the lack of qualified skills, work ethic and general pro-activeness that has lead to this situation. Everyone knows this, otherwise jobs in construction, landscaping and the service industries would have been filled and remained filled by Bermudians, but we went through a significant period of time under the PLP where Bermudians did not want or need those jobs, essentially we set ourselves up for this situation and now the likes of Jason place blame on the employers, well in reality it was the unions and their leaders that never looked at the situation for what it was and started to make the necessary steps to ensure Bermudians were qualified and willing to work in certain sectors of the economy, is that not what the Unions should be doing for their members and the working class? Yeah, I can’t believe it either. He is a self described “Union Thug”! Remember the Tee Shirt he had on Dec 2, 2016? He tried to cover it when he went on camera with the media but the dummy forgot people already saw it when he was going at it with the police!!! What a DA!!! And yet you’re still supporting an expat taking a job from a Bermudian Jason. Exactly which side of the fence are you on? Jason, you always do this sound bite without taking the facts into consideration. Almost every point you have is already available for people of Bermuda. Don’t know what else you want the Government of the day or the CS to do short of actually going out and finding people to put into the training that they offer. if people are serious there is an onslaught of opportunities for them. the certified nursing course offered at BC is a step in the right direction. we need more professional certification courses and attract the right candidates to these opportunities…maybe a mind shift is needed by all of us. Approx. 80% of working age Black Bermudians (all education levels) work for the government. Until Black Bermudians own their own businesses the government will remain the only viable source of a livable wage. Pay tax or hire Black Bermudians; that’s easy. Your arguments do not fit into a Bell Curve – most people are average. Jason is a trained statistician btw. IF WE HAD continued the trends of 2011 – 2012 (PLP Govt.) per Chart 1 above, our total workforce at the end of 2015 would only be approx. 29,575 instead of 33,319 a whooping 3,744 LESS JOBS. Source – Bda. Govt. Dept. 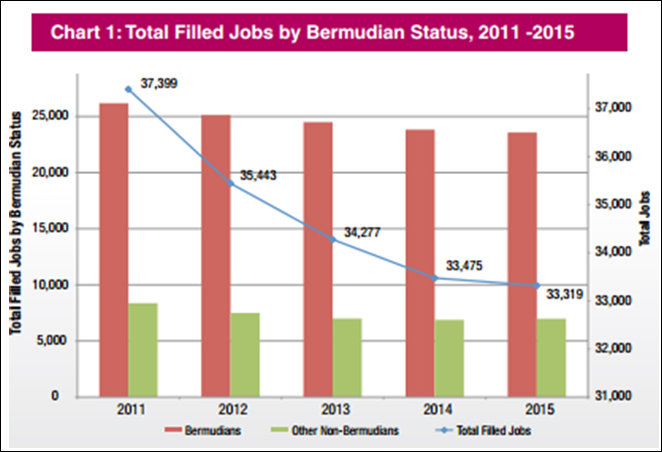 of Statistics – The Bermuda Job Market Briefs published June 2016. The BERMUDA Department of Workforce Development oversees labour relations, career development, and training in Bermuda. The Department of Workforce Development processes labour relations disputes. I wonder if Bermuda can be governed right from here..?…We can get rid of all those paid politicians who are unqualified buffoons because we’ve sure got an abundance of Einsteins right here among us with every answer or solution to any task at hand…right? ?